89% of a users mobile monthly usage on smartphones is done via applications, whereas the remaining 11% is done through mobile web. The split is similar for tablets, with 81% of time spent on media is through applications, whereas the remaining 11 % is through mobile web. 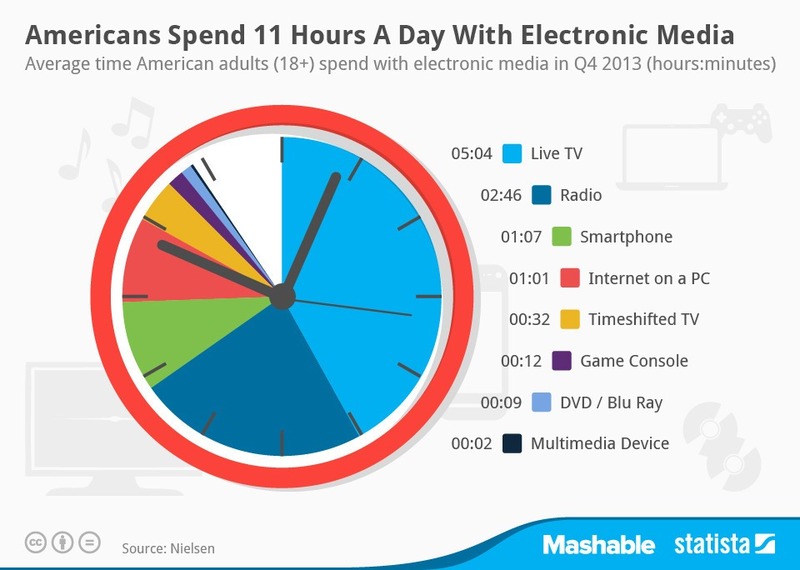 The average American spends 11 hours a day with a form of electronic media. Below is a chart from Statista that pretty much exhibits how those 11 hours break down for the typical user. In this era of digital media, it’s clear that the average person is dependent on digital media and will use a variety of devices to access information or find entertainment. Oddly enough, radio seems to still be a significant form of digital media (second after live television), and when digging deeper into the statistics, I was shocked to see that the number is still rather high when looking at the 12-17 and 18-24 age segments. Smartphone usage and time spent on the internet follow suit, which isn’t surprising and should only continue to rise in the coming years. Based on the information below and your own personal experiences, do you think 11 hours a day is too much or too little? Enter your email address to follow the social media ninja and receive notifications of new posts by email.